When it comes to home gadgets, I'm the nerd in the house. I'm the one who researches smart TVs, adjusts all the clocks twice a year, and programs the thermostat. Sean doesn't have a clue how to optimize our in-floor heating usage, nor use our automatic espresso machine. So when I hear of a new home product, I'm intrigued. Dyson reached out to tell me about the launch of two new products today. I'm already a big Dyson fan (I have an upright vacuum and my Cool fan has been keeping me from melting all summer) so I was curious as to what those clever engineers had dreamt up next. That's the prettiest Humidifier I've ever seen. Do you have a humidifier? In our Canadian home, it's pretty much a necessity during the winter months. The air gets dryer which causes us to cough (and snore!) more at night, my skin gets dehydrated and we become more susceptible to colds and flus with all this time spent indoors. I didn't realize this but existing humidifiers can be unhygienic. Since they don’t treat the water, bacteria in the tank can be transmitted directly into the room. Uhm, I don't remember the last time we cleaned the humidifier so, yes, I'm probably guilty of spreading bacteria-laden water around our house. Ew. In contrast, Dyson's Humidifier uses ultraviolet light to kill 99.9% of bacteria in the water. Air Multiplier™ technology (just like in the Cool fans) is used to project the clean and hydrated air around the room evenly and quietly. You can even use the Humidifier as a fan in the warmer months - which is a bonus as our house has no central air conditioning! 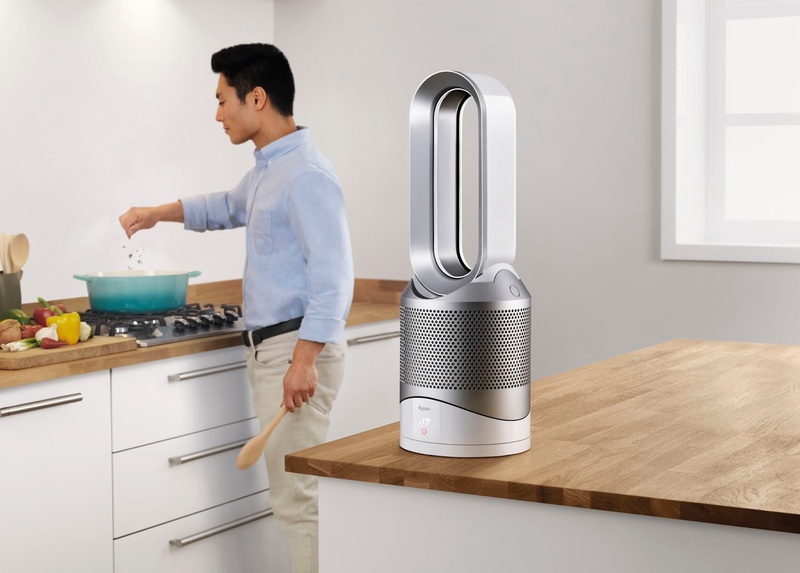 This new contraption is Dyson's Pure Hot+Cool™ Link purifier heater. If ever there was an all-in-one air treatment product, this would be it. It's engineered to remove allergens and pollutants, provide fast even room heating in the winter, and powerful cooling in the summer. And, with the Dyson Link App, it can monitor your air quality and automatically adjust airflow to maintain targets, even when you're not home. I work from home and Sean suffers from allergies and asthma so I'm very curious to see if a product like this would make a noticeable difference to us. Dyson will be providing me one of these to try out so I'll let you know what I think. But for now, I'm going to enjoy the few summer days left that I can throw the windows open and enjoy the fresh air!